The manual allows you to be far more productive and consistent whenever you need to perform one of the major aspects of your rental business. Simply go to appropriate chapter with a proven checklist of procedures to accomplish the tasks. No longer will you start from scratch in your thought process every time something needs to be done. Instead, simply follow proven procedures that work (which you can continually build upon)! What Jeffrey has discovered in coaching rental owners over the years (and even in his own experience) is that the vast majority of rental owners do not have a complete "written" procedures manual for their business. This manual was developed for his own use and subsequently to encourage and enable rental owners to use to create, what Jeffrey believes, is one of the most valuable tools in your entire landlording tool box. As Michael Gerber (author of the E-Myth) states, "It's far more ant for you to work ON YOUR BUSINESS than in your business." As you develop your procedures manual, you're indeed working on your business that will greatly improve it, add peace of mind and enormous value to your business. In addition, one of the biggest bonus benefits of this manual is to those seeking to have one or more persons assisting them with running the rental business, be it for small or large tasks. Having a manual allows you to get assistance from others in running your business, without the fear of them "not doing it as good as you" or "like you would do it". With this manual, there is no longer that fear, because now it is not a question of whether the person is performing correctly. Now the question simply is "Are they following the procedures," and if they are, all aspects of your rentals shall run well. Having a good procedures manual is far easier than "hiring" the right people to help you (which is not easy), who even still can fluctuate in regards to their performance level from day to day. Any persons working with you are not always consistent but a procedures manual can help you to maintain a consistent performance level for yourself and "almost anyone" you have assisting you:). And once you have one or more persons helping you and performing consistently well, you then have more freedom to use your time to create more wealth and/or enjoy life and the fruits of whatever you have already obtained. This manual provides an awesome sample reference and even provides mini exercises (with sample responses) toward the end of this manual to further help guide you in customizing all the checklists and more into your own personalized procedures manual to effectively run your unique rental operation whether small or large. The whole goal is that you can use this as a starting point or as a reference to modify/add to your own manual. Also provided with this manual is a CD-ROM created with a Microsoft Word document so that you can easily select or modify parts of this manual as you take into consideration your state laws, local conditions and practices pertinent to your rental business. The other major value of this manual is that its primarily emphasis is on marketing, resident selection, retention, satisfaction and encouraging peak performance of your residents, all which are universal landlording objectives regardless of property type or resident profiles. And of course, you are highly encouraged to add to the procedures, wording and forms that you have used in your rental business that is already working for you. Each chapter consists of suggested procedures and policies on one of the 10 key aspects of your rental business that I believe will most greatly affect your success. At the start of each chapter are suggested KEY INDICATORS or Performance Objectives related to the chapter topic, by which you can measure the effectiveness of your procedures (and the performance of any one assisting you) in that aspect of your rental business. This is vital, because without any measurement, you cannot make improvements. At the end of each chapter are rental forms, some of which tie directly with the procedures discussed. Additional forms are included in each chapter to give you alternative ways of communicating with residents to reach your management objectives, based on your management style and preferences. 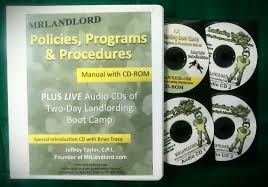 So that those who request this procedures manual has the best opportunity for understanding and utilization of the procedures, policies and programs contained within, a complete set of audio CDs from a two day landlording bootcamp is part of the total Procedures Manual package (10 audio CDs included, including a special segment with Brian Tracy). During the two day training, Jeffrey personally fully covers and discusses each of the major landlording procedures discussed in the manual. This training, he believes is invaluable for maximizing the utilization of the procedures manual. Individuals have paid $699 to attend the two day training and found it to be of tremendous value. You can benefit from this same training, at the convenience of your own space and time. This is only mentioned to emphasize the value of what will you will be receiving with the purchase of the Procedures Manual and BootCamp Training. Order Now! The listed price for this valuable comprehensive resource, Procedures Manual combined with a complete set of Landlording Bootcamp audio CDs is $999, which we offer for only $499 to website visitors. Add to your cart now. You may also want to consider becoming a Boot Camp Membership. As part of that exclusive membership, We will mail you a copy of the latest Procedures Manual plus as part of the Boot Camp Membership you will be given online access to the complete Boot Camp Audio and Video Trainings, free passes for you and one guest to one of our live Boot Camp Trainings, along with thousands of dollars of additional online bonus resources. Go to the following section of our website for nformation on our various Membership Plans. To order just the Procedures Manual and get the CDs and DVDs for $499, click to order below.